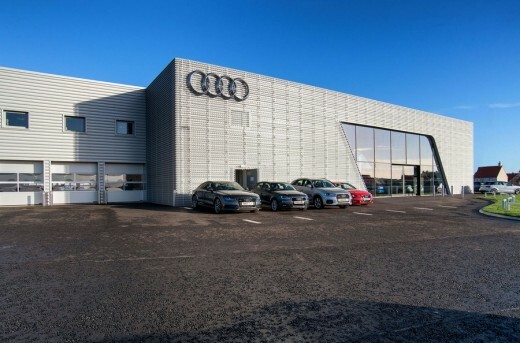 Robertson has secured a third contract to develop an Audi Garage in Dundee, on the back of successfully delivering two car showrooms for John Clark Motor Group (JCMG) in Aberdeen, which is due for completion this month, March 2016. 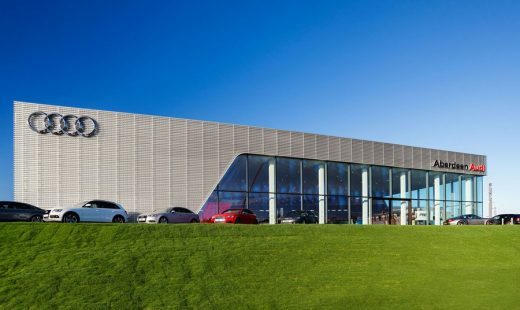 The first contract which Robertson secured with the Motor Group was to construct the £5 million Nissan and MINI dealerships within the Balmoral Business Park in Altens, Aberdeen in 2014. 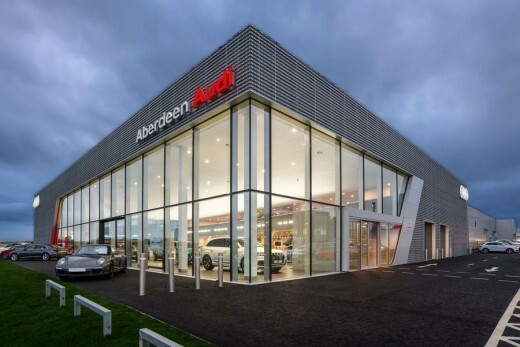 Following its successful completion in 2014 they went on to develop the £9 million Aberdeen Audi showroom, one of the biggest in the UK. Construction began in January 2015 and took 42 weeks to deliver reaching successful completion in October 2015. 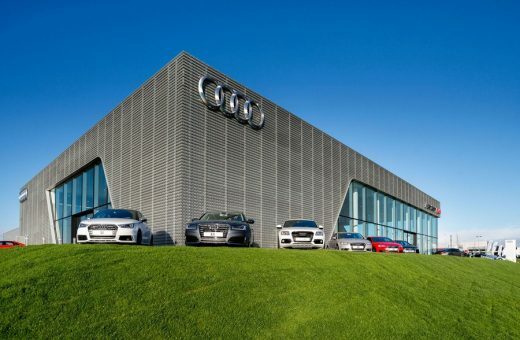 Keith Taylor, regional managing director of Robertson Eastern said: “The team has become highly experienced in delivering high-specification car showrooms working to the highest, exacting standards imposed by the car manufacturers. They also project managed several client appointed specialists during the construction process including Corporate Workspace and Straightset for the furniture and workshop fit-outs. Audi design and brand standards mandate the very highest precision and quality for all finishes. The modern facility incorporates specialist features including a dramatic curved feature wall, unique mesh effect over-cladding and curved ceilings. 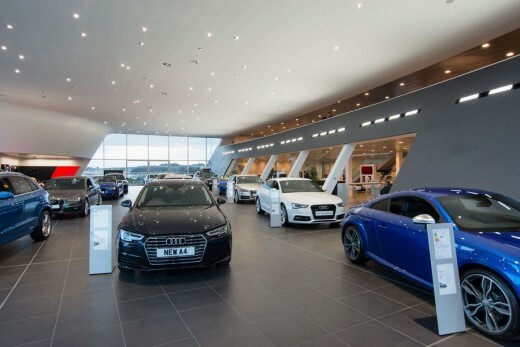 The main 10,000 sq ft showroom has space to display over 20 new models under a specially designed lighting system as well as accommodating staff offices and storage facilities. The showroom also boasts two customer lounge areas for customers to either work or relax while they wait for their vehicle in the workshop, plus a children’s play area to keep the young ones entertained. There is also a separate building on-site to house 12 used cars. The premises includes an 18,000 sq ft workshop with space for servicing in excess of 30 cars. Each bay includes a hydraulic vehicle lift which is cast into the concrete floor allowing them to be fully recessed. There is a convenient three lane automated drive-in service for customers visiting the workshop which is located adjacent to service reception ensuring the customer experience is seamless and efficient. Robertson is a privately owned group of companies working in infrastructure, support services and construction, directly employing over 1,700 people. Operating throughout the whole of the UK, we have a well-established presence across Scotland and the North of England. The group consists of 18 distinct Robertson businesses, covering the entire built environment lifecycle. These include timber-frame engineering, facilities management, a capital projects business dedicated to public sector partnerships, property development, regionally based construction companies, civil engineering, building services, and businesses that deliver high-quality homes for the private and affordable markets. Spread across the private and public sectors, our clients include local authorities, the Ministry of Defence, NHS, Tesco, ASDA, M&S, Scottish Natural Heritage, Travelodge, Premier Inn, Highlands and Islands Enterprise, John Clark Motor Group, the Edrington Group, Glasgow Caledonian University, Diageo, Everton Free School, Siemens and the Scottish Futures Trust. Aiming to deliver outstanding results and environmentally sound solutions for our clients, we work in close partnership with them to achieve these goals. We are dedicated to creating value and operating in a safe, sustainable environment for the clients, partners and communities we serve. We are firmly committed to our Young People Strategy and Community Benefits programmes.